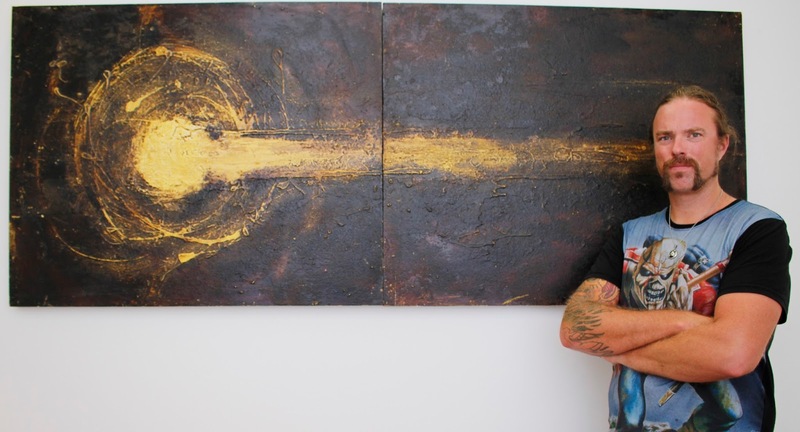 Neal Booth is a dedicated father co-parenting his children, working to support himself, and committed to making art. His academic achievements include completion of a Master of Philosophy (Fine Art) for which he received a scholarship. Neal loves connecting with nature and the building materials of the earth. His colour palette reflects this quite directly as he uses the materials of the earth as his pigment and paint. It is a sophisticated and restrained palette, layered, distressed or harshly ground back and re-layered through to completion. There is an obvious influence of the works of Anselm Kiefer and Neal spoke of his connection to the work of Andy Goldsworthy, and the writing of American art critic and sculptor Donald Judd. Raw materials are physically collected from places that hold significance and transported back to be transformed. Neal uses various acrylic emulsions to stabilise the individual substructures in his process if necessary. The small photographic works were all taken at times and in places that hold sentimental attachment. The works appear solid and heavy but sometimes looks can be deceptive and perhaps the physical strength of an object is the result of soft, light, vulnerable individual layers laminated and impacted together to create such strength or the illusion of same. In a reversal that is not uncommon Neal finds himself a teacher and mentor to his mother who is currently following in her son’s footsteps and undertaking studies in Fine Art at University level. This is an exhibition of professional and polished works. I absolutely love this collection of pieces. Vasanth has a Master of Sociology and has been making art for 17 years as a self-taught artist. Three years ago he moved to Australia with his wife Pravina whose family is located in Australia. 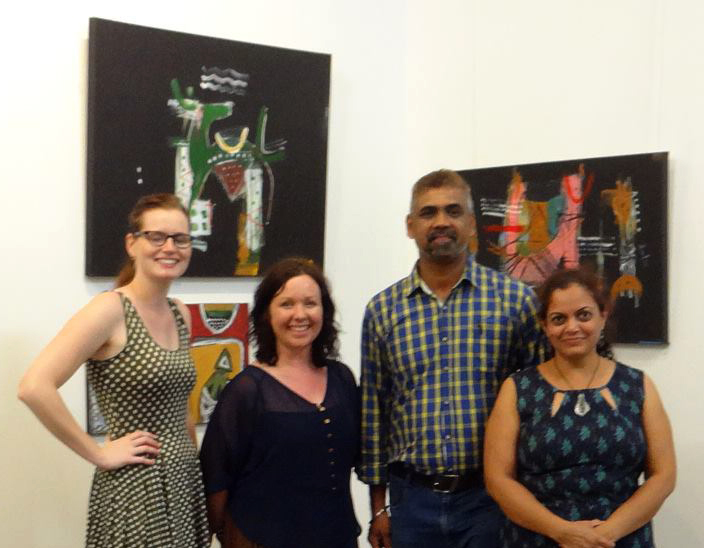 The foundation of Vasanth’s art is based within his love for Indian folk and tribal art. When I talked to Vasanth he was passionate about his choice to engage with honest, innocent and expressive elements within his work. His visual language comes directly from his heart without pre-planning as he immerses himself into a personal exploration of identity. There is so much colour, and pattern-making sitting on the surface of his works. Marks are applied almost with child-like eagerness to release the joy he finds while in this creative state. Drawing is as much a part of his daily ritual as sleeping and eating. His many exhibitions allow for evolution of ideas and practice while receiving feedback and interaction with the viewer. For Vasanth life and art are beautiful and making it brings him satisfaction and hope. There certainly is joy, colour, and both spontaneous and planned mark-making within the works. I have never seen work like this before or not that I can remember. Some works utilise a black background which provides a dynamic space on which to layer energetic visual expression. Others show that urgent, free, unrestricted and expressive mark he applies with acrylic and oil pastels. What a lovely experience listening to Vasanth speak exuberantly of his art experience with such passion.